As much of the east coast of America braces itself for the arrival of Hurricane Sandy, around 7,000 transatlantic and US domestic flights have been cancelled, with further cancellations also expected tomorrow and Wednesday. 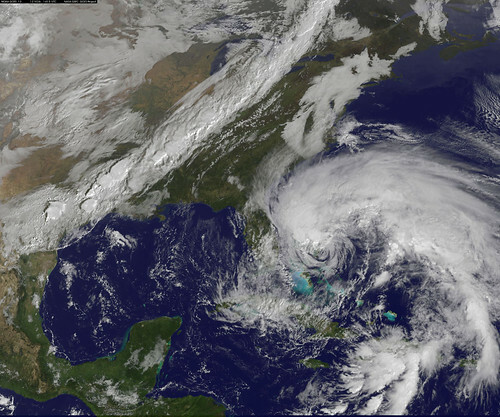 Hurricane Sandy is predicted to collide with a winter storm to create a potentially catastrophic weather system. As a result, 375,000 people in low-lying areas have been ordered to evacuate, and all of New York’s public transport system has been closed. Dubbed “Frankenstorm” it is expected to bring a “life-threatening” surge flood to the mid-Atlantic coast, including Long Island Sound and New York Harbour. It has already killed around 60 people in the Caribbean, and many states across the east coast have called a state of emergency. Alex Sosnowski, expert senior meteorologist for AccuWeather.com, said: “Storm surge flooding will occur over a much larger area, when compared to a hurricane and more severe than a typical nor’easter. British Airways has cancelled all flights to and from New York, Baltimore, Washington, Boston and Philadelphia, with the exception of the BA238 from Boston. It is offering customers the chance to change their travel plans if they are due to travel to or from the east coast from October 26 to October 31. Virgin has cancelled flights to and from New York, Washington and Boston and has also cancelled flights departing from JFK and Newark early tomorrow (Tuesday). According to flightaware.com, every airline is offering free changes (and in some cases refunds) to itineraries which will potentially be affected by the storm. The BBC has regular updates on the storm’s progress, and for photos of the storm, there has been a Facebook page set up with regular updates.